John Lennon wrote the tune after hearing Peter Fonda whine about how he died and came back to life during a hallucinogen enhanced party. John didn’t care much for Peter so he credited the words to a female, but it just underscores his brilliance as a writer. Another flash of brilliance was writing I am The Walrus in response to an English class dissecting his words and searching for hidden meanings. That was John Lennon, genius and member of a historic and cultural phenomenon rock and roll band that blew into our lives in a vortex of world changing thoughts. Imagine! The Fab Four, the boys of Liverpool, The Beatles. In retrospect I use the Beatle as a barometer of the status of my coming of age. They shook the very foundation of our country in one performance. That performance was on another cultural institution, The Ed Sullivan Show. Back in ‘64 we had only one TV for all of us to share and after family deliberated in the traditional family democratic fashion we all watched what Dad told us to. That was my introduction to a one sided democracy, but I was too little to engage in politics at that time. No matter, it was cool, the times were different then and that’s how most families viewed this high tech medium we called the idiot box with bits glowing tubes hidden behind the screen. The family gathered and watched one of three available channels, and The Ed Sullivan Show dominated Sunday evening prime time in most homes. I was excited because there was some new band from England on the show that night and they had girls screaming their names. I have four older brothers so my introduction to rock and roll was their 45 record collections of acts like The Everly Brothers, The Four Seasons, and a slew of others including Elvis the Pelvis Presley. I sat on the floor transfixed as The Beatles played a few way cool tunes! Mesmerized! When they finished I had an epiphany. I now had my own music to listen to, not my brothers or anything else. I called my good friend Ray to make sure he saw them, because our world was about to change and I knew it. The Beatles. The next day I decided I was gonna take the greasy kid stuff out of my hair and try and sneak some mop top looking bangs past my Mom. Growing my hair proved to be much more difficult than I believed it would, but I kept at it. For years! Through tears, arguments, fights, and a few times being physically dragged up to Frankie The barber for a nice crew cut I did everything within my limited power to have a Beatle haircut. Eventually I prevailed but it left some lasting bad feelings with my folks. All from that one night of Ed Sullivan which changed my life. I rocked out to the hard driving love song of the boys and other acts like them for the next two years. In December of 65 is when Rubber Soul came out. Game changer!!! I was all of ten years old and suddenly my music world expanded immensely. Unusual instruments and sounds and their hair went from cute mop tops with bangs to a longer cut, like a girl. That’s what I wanted. I read every teen magazine article on the Beatles, bought Beatle trading cards and whatever 45’s came out, and was changing along with whatever The Beatles did. The next album was “Yesterday and Today” which is when I learned what controversy meant. The cover of the album was described by Paul as “Our comment on The Vietnam War” , sometimes referred to as “the butcher cover.“ The boy were dressed in butchers smock with meats and plastic doll parts on them. It pissed off my Mom and Dad, so I knew it was important and I embraced the Beatles even more. Now at age eleven, I was learning about politics while listening to even newer sounds by my hero’s. I remember when Kennedy was shot but didn’t fully understand the implications. But I got that it was a profound moment in all our lives. I was much more aware when King, and Robert Kennedy were shot, fully aware of the implications. I followed the happenings of the Chicago Eight, or Seven if you forget Bobby Seale, became involved in protests, sit ins, attended peace rallies and was far more in tune to life than ever before all due to growing emotionally, mentally, spiritually, and politically along with The Beatles. I was fortunate to grow up in that era an I took full advantage of what they offered, way beyond merely their music. I wasn’t prepared for what happened December 8th, 1980. Now another cog in the working class with a family. I was painting my kids playroom and listening to the radio when the music was interrupted to tell us that John Lennon had been shot an killed. It was a deeply felt emotional punch to the solar plexus. I put the paint brush down, sat on the step ladder and wept. The collective shock and sorrow felt by fans was like Images of broken light which dance before me like a million eyes. They call me on an on…..Across the Universe. 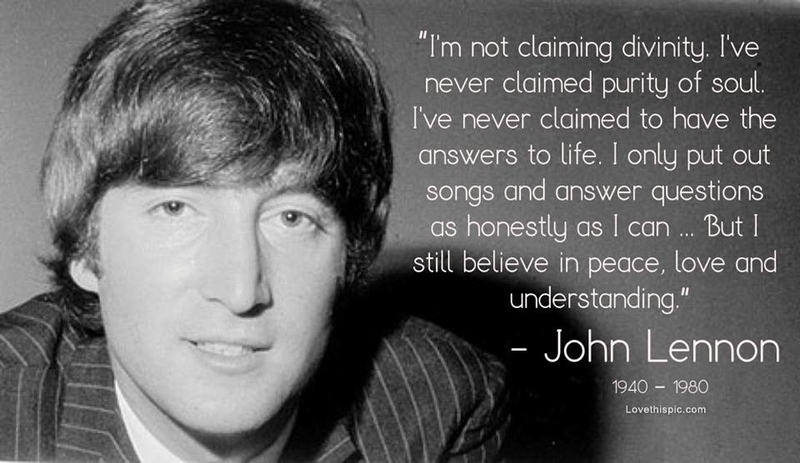 That’s why I mourn John Lennon as a family member, because without even knowing who I was he helped shape me into what I became. Rock In Peace Mr. Lennon, and thank you for sharing so much of your soul with a world that needed you. Peace..